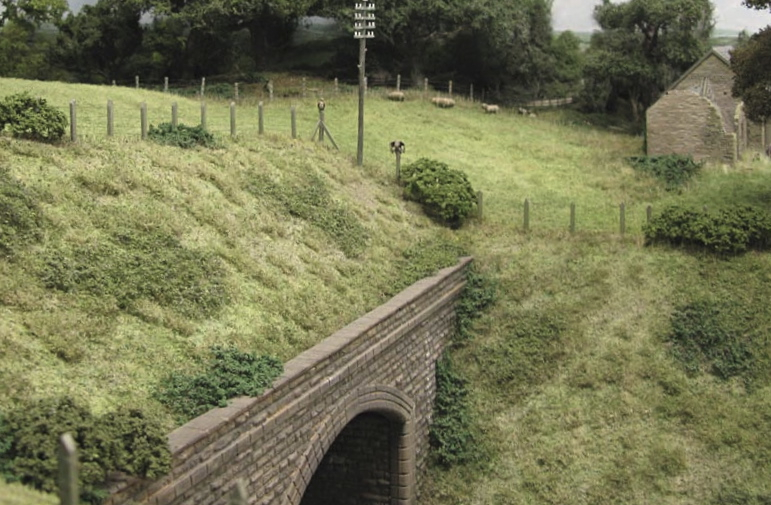 The layout “Holiday Haunts” was inspirational to many; the location at Dawlish on the Devon coast, a full height backscene hiding the operators and a constant flow of quality rolling stock ensured its popularity. The Holiday Haunts seaside layout. 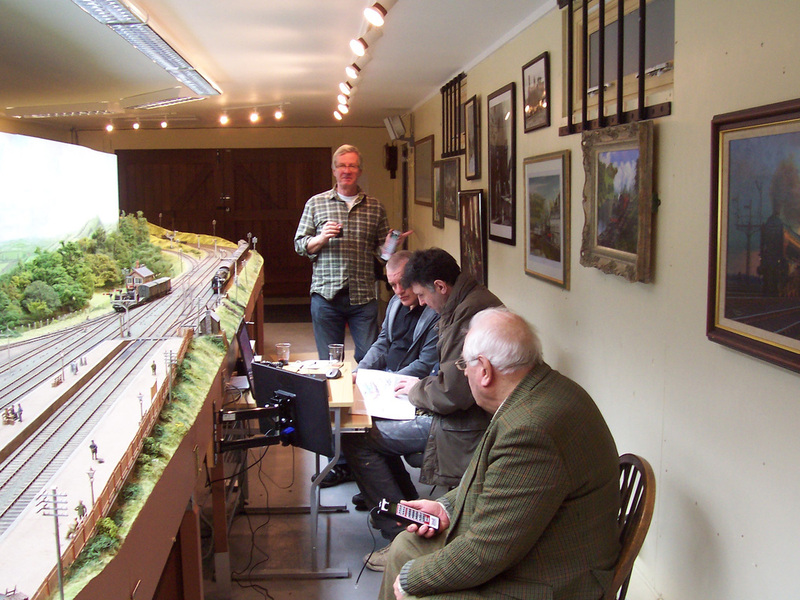 Late on the Sunday afternoon at the annual O gauge Jamboree at Telford, I was leaning on the barrier watching the trains go by, the crowds had long since dissipated, yielding for the first time that weekend some elbow room. An equally appreciative friend Mike Morris interrupted my reverie and we enjoyed the view in silence for a while. Those moments sowed the seed that eventually became Bucks Hill. I can’t remember the exact year but it must have been in the early to mid 1990’s. The die was cast, the new project would be a “roundy roundy” and preferably a real place. Mike volunteered to do some research and seek out a few possible locations. Pontrilas station looking east, with the Golden Valley branch train to the left. 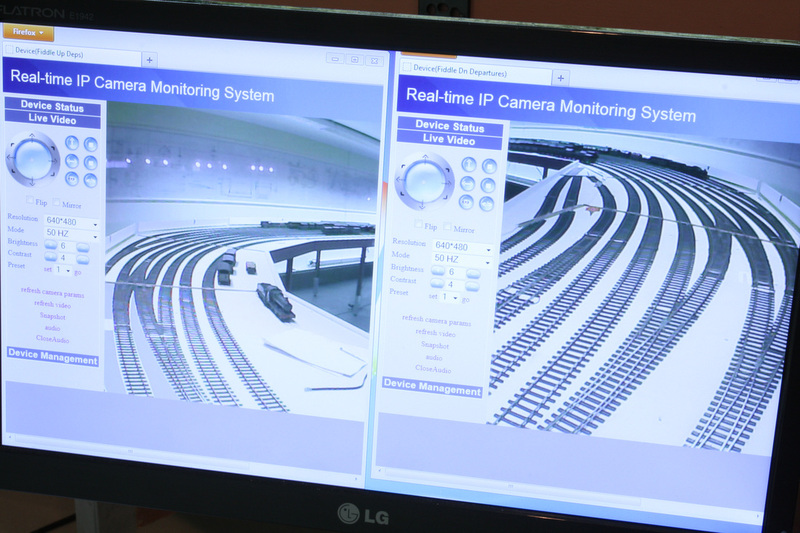 ​The main criteria were, twin track main line, predominately GWR and preferably with a branch line. As with many deliberations of this nature a supply of ale from the local hostelry seemed to help, certainly with volume if not common sense. 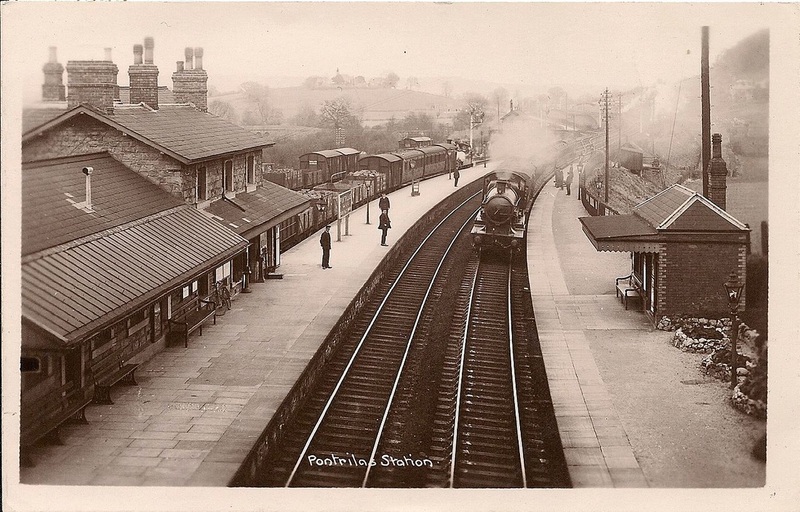 Eventually, Pontrilas in the Welsh marches was deemed the best option, as it was GWR with LMS running rights, the junction for the Golden Valley line and had attractive buildings etc. 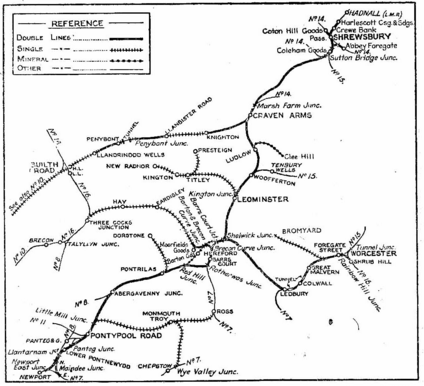 Local connections between Shrewsbury, Worcester and the South Wales coast. Zooming in here, the Golden Valley Branch line is in bold. The diagram closely replicates the 1930s Pontrilas arrangement, with the characteristic short tunnel directly at the down platform ends. 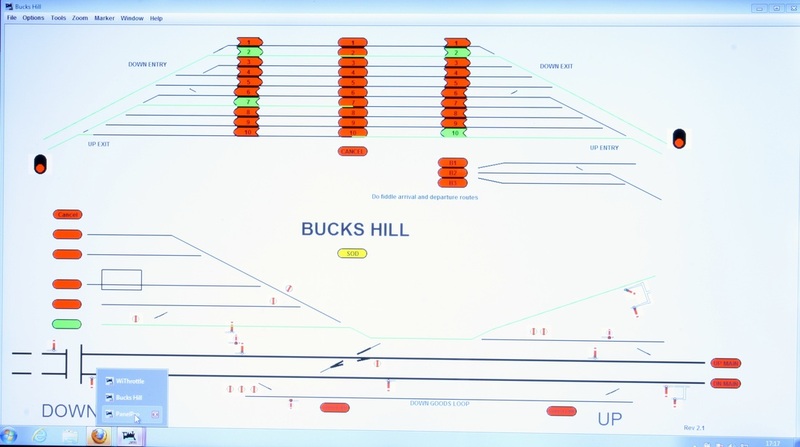 The control screen sets the routes and signals, an incoming Golden Valley branch train has the bay platform road here, as indicated by the green highlight. As a driver, you can wait for your signal and move out of the storage sidings and onto the layout. This is where you see the approach of your selected train from the otherwise concealed sidings. We changed the name to Bucks Hill in order to run anything and everything without critical observations, however, in retrospect we should have stuck with Pontrilas it is after all a pretty accurate representation, but there you are, too late now. From the outset DCC was chosen as the control system, this decision was based on little more than a dislike of rows of section switches. I also wanted any length train to be accommodated in the fiddle yard without concern for exact location, allowing for guest stock etc. We had zero experience of any of the systems indeed it was early days for DCC in the UK, in the end the decision was based on the financial health of the supplier. Digtrax was one of the few with a balance sheet that I could analyse, so the choice was made. It is worth admitting at this juncture that I am an electronic dunce, and that without the help and encouragement of an expert in Adrian Newson the thing would never have worked. He built the panel and provided annotated drawings and printouts for said dunce to follow. Thinking back, pretty much everything was a first so when it came to the scenery stage everyone looked at everyone else and shrugged their shoulders. So it seemed sensible to ask a friend! Enter stage left Barry and Gill Norman, Gordon and Maggie Gravett, Chris Gates and a case of red wine. A weekend was spent sticking down acres of bleached carpet underlay followed by weeks of clipping and tweaking. A suitable colour was finally agreed and multiple coats of thinned Humbrol green enamel were applied. Tony Hill introduced us to puffer grass and other techniques, which Chris pursued and perfected. These topics are covered in depth in the MRJ articles in the home menu. Carl Legg was, throughout the project and right up to his premature death, a stalwart supporter, providing trackwork and buildings. It was he who was adamant that we should target the Gauge O Guild 50th anniversary show as our launch, which we achieved, with the project comparatively complete. 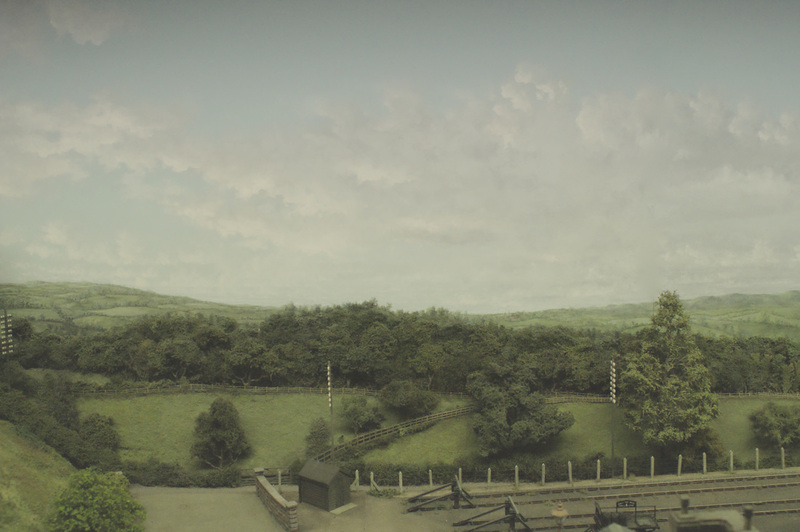 The layout boasts a magnificent back scene by Paul Bambrick and is now fully digital. It is perfectly possible to run solo but is much more satisfying to share with the many friends I have made on the journey. Callow Hill and surrounding woodland on the backscene rear panel. Chris Gates reads a book instead of paying attention.